The old school Kings of Late Night are all gone, and 2015’s freshman hosts are now the upperclassmen, and this year there’s a new man in town and she’s a woman. It’s been a busy year for late night, with the election, Trump, the brutality of a year where we lost so many entertainers, terrorism, and everyone was put to the test. Not everyone’s show survived this year (Sorry Larry Wilmore) and a brand new show has brought about the rise of a new power player- Samantha Bee. We all know Jimmy Fallon continues to lead in ratings, but we’re not talking about ratings. 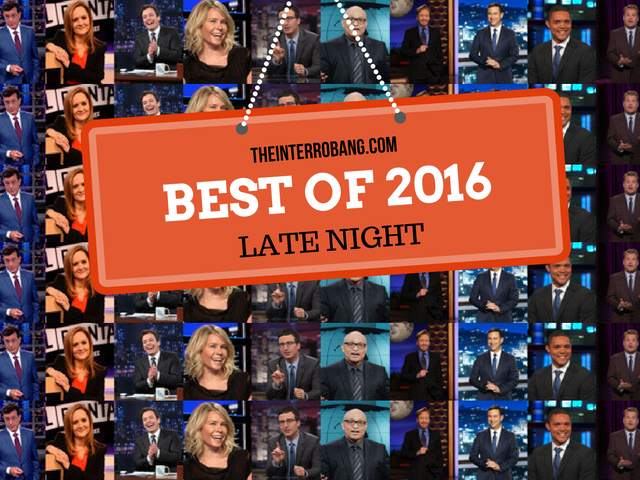 Now that the dust of 2016 is settling, who is the late night host with the most of whatever it is you tune in for. Vote however you want- best looking, best set, best sidekick, best guests, best monologue, whatever you think a late night leader should be. Decide for yourselves who is this year’s Late Night Champ. It looks like Seth Meyers avoided the dreaded Sophomore slump in a year where it really mattered. With no Jon Stewart and a watered down Colbert, Seth really grew into position as the go-to political guy in the NIGHTLY Late Night talk show world (Sorry John Oliver). His interviews have been solid and he’s done a great job of bringing his snarky Weekend Update charm into his late night role. Let’s see what he can do in these next 4 years to be different from the rest of the pack. You don’t watch Jimmy Fallon for the “thrilling” interviews, or the “high-brow” comedy. Fallon fans tune in to see a big kid, Jimmy Fallon, having a ball living out his dream job and goofing off with celebrities you’re used to seeing in a more serious light. Whether it’s laughing at any given story, playing pizza gold with President Obama, having a Lip Sync Battle against Melissa McCarthy or playing Charades with Danny DeVito the one thing you can’t deny is the guy is having fun and it’s made him the ratings king of the current late night landscape. Who would have thought such an easy concept would capture the heart of Americans and go so viral? Get singers in a car and sing along to their music with them. It’s a concept you want to dislike, but find yourself having a good time watching and it’s Corden’s pure joy and contagious charm that makes it work. Corden also did a bang-up job hosting the Tony Awards and is a welcome change in the Late Night world opting to keep a British Chat Show vibe instead of the typical desk and couch. Two Jimmys at 11:30 and they couldn’t be any more different, Kimmel is cocky and not afraid to be less family friendly than the others, taking advantage of the fact that it’s late night and he can do what he wants. While one Jimmy likes to play with guests, Kimmel likes to play with fans and passers-by even if they’re not in on the joke, choosing to do segments catching random people in lies, have strangers compete against each other on Skype and see if celebrities can recognize random people from their past. He’s kept up his bromance with Ben Affleck and gotten into some more drama with enemy Matt Damon, the longest current running “feud” in Late Night. Kimmel has done a great job of creating his own legacy on a network with no other Late Night shows and a show that he originated. While some people thrived in their sophomore season, it hasn’t been the easiest path for Noah, especially as a man born in South Africa expected to fill Jon Stewart’s shoes in the most dramatic and divisive election of this generation. Noah has put together a solid staff of correspondents and has shown flashes of brilliance like his recent interview with Tomi Lahren where he didn’t hold anything back. Now the lone man on Comedy Central, hopefully 2017 can be the year Trevor really finds his stride. The “old-man” in Late Night, Conan O’Brien has given himself a little bit of a career renaissance since he found a gimmick that really worked for him. For years, some of people’s favorite moments on Late Night, his short stint of The Tonight Show and now Conan, were his remote segments where he just went out and interacted with people, now he does entire remote episodes, but not just out of studio, out of the country. Being on a weekly show on premium cable can be seen as a disadvantage for some, but John Oliver has really taken the ball and run with it. How many Mondays did you go online only to see something Oliver said the night before trending, and he did that without games and celebrities or pranks, just with his words. Who would have though the biggest voice when it came to politics this year would be from an Englishman! It takes a certain type of woman to host Late Night and Chelsea Handler does it with ease, using her wit and charm to captivate her audience, she’s definitely a force to be reckoned with. After hosting Chelsea Lately on E! for years, she’s started her own path on Netflix as host of her new talk show Chelsea. Competing with the men of Late Night, Chelsea Handler holds her own with her unapologetic personality and off the wall interviews, she’s one of the strongest voices for women out there today! She breaks the format, and does it skillfully. Premiering in February of this year, Full Frontal with Samantha Bee has been a consistently hilarious and unique alternative to the typical late night show. Having been a former correspondent for The Daily Show, Bee seems to fill the void of political satire in the wake of Jon Stewart’s departure from television like no other. Full Frontal’s election coverage alone could push her to the top of this year’s late night best of the best. The show’s unapologetic bold humor, strong female perspective, and solid joke writing makes you wish her Monday night slot on TBS was a five day a week deal. Larry Wilmore may not have survived the entire year of 2016 as a Late Night Host, but he can undoubtedly be proud of the work he did in his time slot. Wilmore is one of the most talented comedians out there and has been involved in some great television prior to hosting The Nightly Show or even being a correspondent on The Daily Show . He shook up his audience with his controversial political views, his most memorable moments were his “unblackening” segments. 2016 is Colbert’s first full year as the host the Late Show – he’s the only other host of the show outside of David Letterman, which is some history that truly matters to any fan of Late Night Comedy. He’s gone through a change of showrunners, but in the end, he’s really starting to come into his own voice. Colbert has a sharp wit and is a great commentator with a top notch house band fronted by New Orleans musician Jon Batiste.